The current Senate Leader and the former Senate Leader, both members of the APC are battling for the bulk votes of the PDP ahead of the inauguration of the 9th National Assembly on June 10. 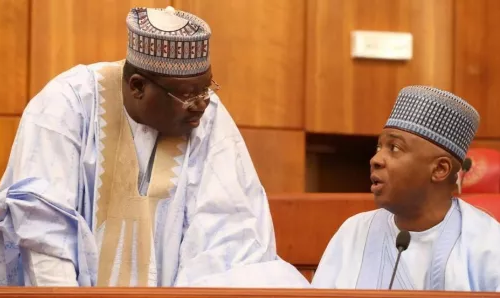 Senate Majority Leader and APC candidate for the Senate presidency, Ahmed Lawan, has reached out to some Peoples Democratic Party governors to brighten his chances of winning. This is contrary to the ruling party’s national chairman, Adams Oshiomhole's earlier position that the party would not need the PDP or opposition for its candidate to emerge winner in the race. Lawan’s adoption by the ruling party’s National Working Committee has divided the party, with Senators Ali Ndume (Borno) and Danjuma Goje (Gombe) insisting on contesting the post. Oshiomhole had, shortly after the NWC’s adoption of Lawan, said the ruling party did not need the PDP lawmakers’ votes to clinch leadership seats in the National Assembly. He cautioned against any power sharing deal with the opposition party. He boasted that all committees in the Senate would be chaired by the APC senators. But Lawan met with three PDP governors during the week to seek their support. The Punch learnt that he met separately with Governor Aminu Tambuwal of Sokoto State and Governor Ifeanyi Okowa of Delta State as well as Imo State governor-elect Emeka Ihedioha in Abuja where he sought their support for his Senate presidency bid. It is however not clear whether he made any commitment to a power-sharing deal with the PDP. 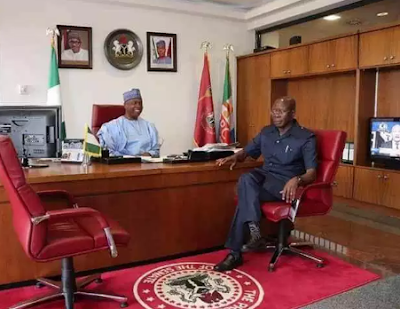 Spokesman for the Lawan-for-Senate President Campaign Organisation, Senator Sabi Abdullahi, confirmed that the Senate Leader met with some governors. Abdullahi, who is also the spokesperson for the Senate, described the meetings with the governors as “successful”.